A jailbreak has been released for all compatible iPhone, iPad, and iPod touch models running iOS 9, iOS 9.0.1, and iOS 9.0.2. 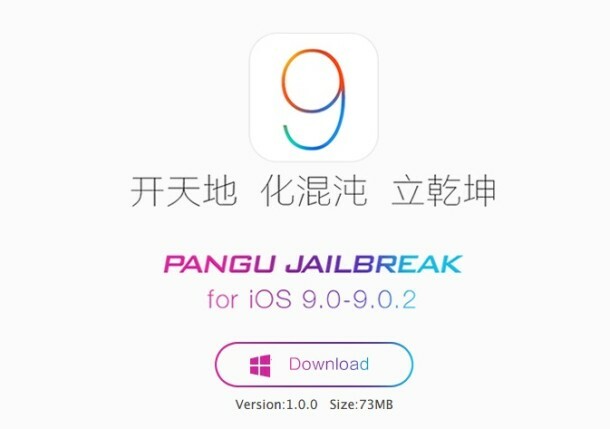 Arriving out of China, the Pangu jailbreak is the first for iOS 9 and iPhone 6s and iPhone 6s Plus. Jailbreaking is intended for advanced users of iPhone, iPad, and iPod touch, and is not appropriate for the average user. There are many reasons why you shouldn’t jailbreak, including the potential introduction of security vulnerabilities, less reliable iOS experience, and perhaps most important, the potential for Apple to deny warranty service and support for a device with an active jailbreak installed. Those who are comfortable with the risks associated with jailbreaking can follow the instructions below to jailbreak iOS 9 with Pangu using any compatible iPhone, iPad, or iPod touch mode. Currently, the Pangu tool runs in Windows, but an OS X version is expected to be released for Mac shortly. You’ll need to provide Pangu with access to your devices Photos during the process. Once the jailbreak has completed, the iPhone or iPad will reboot and you’ll find the familiar brown Cydia icon on the devices home screen. Remember, users can undo a jailbreak by restoring a device from backups made to iTunes. Since Pangu is currently limited to Windows, Mac users would need to rely on a virtual machine, or wait until the Mac release of the software, which will likely arrive shortly. Heads up to iPhoneHacks for detailing the process on Windows. Its ONLY AND ISSUE if YOUR A THIEF! and use PIRATE APIs! Why don’t you title this article “How to destroy iOS 9 security features on your iPhone or iPad with Pangu”? There is no benefit that you can get from jailbreaking that outweighs the loss of security. I guess this article serves as ad click bait for OS X Daily, but it’s irresponsible to post something like this. As a managed IT service provider, I will refuse to support jailbroke devices. I don’t want them on my networks. Some of our readers like to jailbreak their iPhones, it’s not something I do on a regular basis or particularly recommend for many reasons, especially now that you can sideload apps with iOS 9. But, to each their own. One assumes that you must ban ALL Android devices on your network by default then!? If you are concerned about security. You folks…should chill out a little..security and all..if THEY want your data, they’ll have it anyway. I enjoy themes, and I want to see more details about jailbreak news, especially from Paul. Jailbreaks from China can be bad, I recommend finding another jailbreak tool which does not come from China. I am not 100% sure that they wont receive data, but I recommend what I am using and I currently do not have any problems, evasion. I do not know if they have an iOS 9 update yet but you would want to check it out. Hey Becky, a lot of phone carriers will unlock your phone if you are out of your contract period. I live in the UK and o2 do this for free. Ps – After I installed the latest update of iOS 9.1, my Messenger keeps freezing up. Has anyone heard this and if so is there a fix? Thanks.